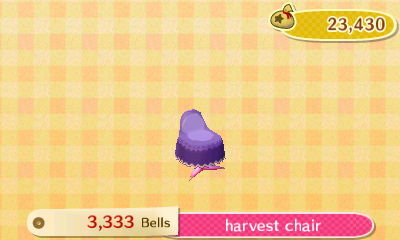 The Harvest Festival, representing Thanksgiving and taking place on the fourth Thursday in November, has taken on a new twist in Animal Crossing: New Leaf. Gone are the days of hunting Franklin the turkey so that he could be the main ''guest of honor'' at dinner. 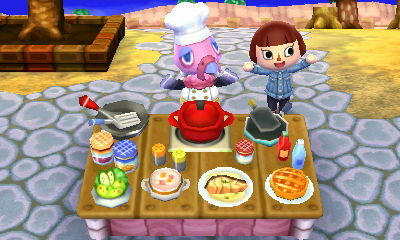 Instead, Isabelle at the Town Hall has hired Franklin to be the Head Chef for the day to cook the Harvest feast for the town. There are five dishes available for each course, but Franklin will cook just one dish per course. The dishes he will choose are random. After speaking to Franklin, he will recruit you to help him because no matter which dish is being prepared, he is missing some vital ingredients. Your role will be to gather those missing ingredients mostly by fishing, diving, and gathering. 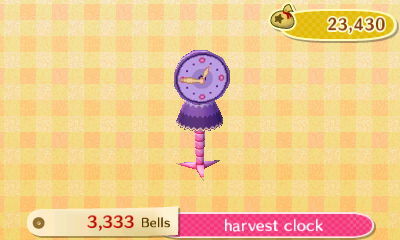 However, some ingredients are items that you don't see in the game at any other time than at the Harvest Festival. They can't be caught by fishing or diving, neither can they be bought or harvested. They can only be acquired from your villagers who are at home, but they will make you work for it. 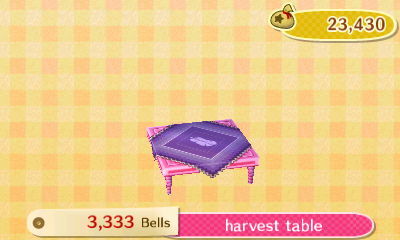 During the Harvest Festival, all the villagers who are at home will be mysteriously cooking, whether they have kitchens or not! The results of their meals are never seen but they will constantly ask you to fetch ingredients for these unseen meals. In return for your help, they will provide you with the unique ingredients that Franklin has requested for his recipes. 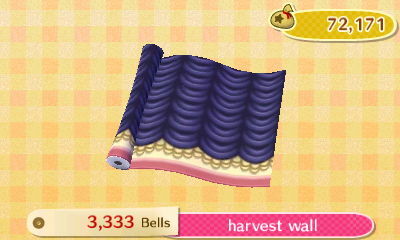 Throughout November, Timmy & Tommy will sell the Harvest Series furniture items, and the Harvest Rug and Harvest Wall. 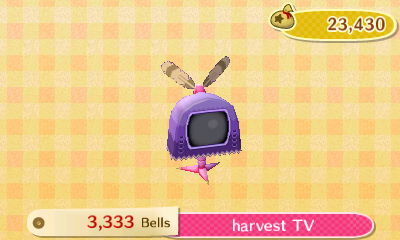 You also receive 2-4 pieces of these items from Franklin during the Harvest Festival. 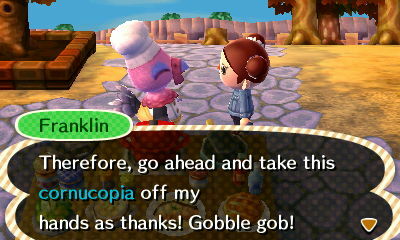 If you are going to be limited for time on the day of the Harvest Festival it is worth preparing in advance to ensure that you are able to provide ingredients for Franklin and your villagers. You will need a fishing rod and access to a wetsuit in order to be able to acquire most of the necessary ingredients for the feast. Fish - River: Barbel Steed, Black Bass, Carp, Crucian Carp, Dace. Fish - Sea: Barred Knifejaw, Dab, Horse Mackerel, Olive Flounder, Red Snapper, Sea Bass. Fruit: Apples, Bananas, Cherries, Coconuts, Oranges, Lemons, Peaches, Pears. Seafood: Clam, Lobster, Oyster, Scallop, Seaweed. Beehives can be collected by shaking trees, but be prepared to either run indoors or catch a bee if you don't want to be stung by an angry swarm. 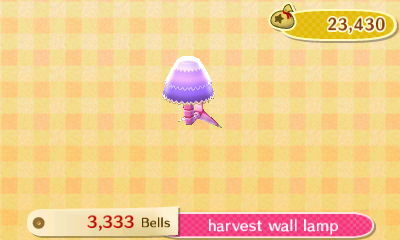 Mushrooms will appear daily in your town throughout November and are easily acquired in advance. More information about Mushrooms can be found in the Mushroom Guide. As said earlier, you will need a fishing rod and access to a wetsuit in order to acquire some of the ingredients for Franklin and your villagers. However, if you have recently started your town you may find that you have neither. Here is how to acquire both pieces of equipment, and also how to obtain some fruit. A fishing rod is needed to catch the following fish ingredients. River: Barbel Steed, Black Bass, Carp, Crucian Carp, Dace. Sea: Barred Knifejaw, Dab, Horse Mackerel, Olive Flounder, Red Snapper, Sea Bass. A basic fishing rod can be bought in the Nookling's store. However, if you've only recently started your town it may take a few days for a fishing rod to appear, and you may not have the luxury of time. 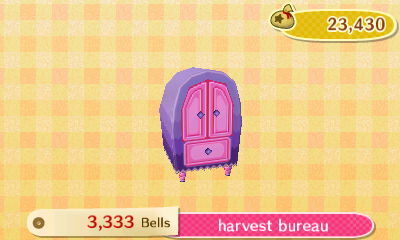 Instead, head on over to the Town Hall and speak to Isabelle by standing at the counter. Repeatedly ask her about advice for living in the town, and follow her instructions. Eventually, you will get the option of trying out fishing or bug catching. Choose to try out fishing, and Isabelle will offer to sell you a fishing rod for 500 Bells. The wetsuit is needed to go deep-sea diving and catching the following ingredients from the seabed. The wetsuit isn't strictly essential if you are prepared to be sneaky. When Franklin requests a seafood ingredient you can save your game, quit, and reload. This way, you can speak to Franklin again and get a request for a different ingredient that doesn't involve seafood. However, if you want to immerse yourself in the entire Harvest Festival experience, then to get your hands on a wetsuit you will need to access the island. But, you have to be invited, and this invitation is an unlockable feature in the game. First, you need to have paid Tom Nook 10,000 bells so that you live in a house, and not a tent. Next, you need to have paid off the 39,800 first mortgage. After that, Tortimer, the Town Mayor in the previous versions of Animal Crossing, will appear on the start-up screen when you next load your game. He will inform you that you should meet him at the dock. When the game loads and your character appears outside of your house, it is then essential that you make your way to the dock in your beach area. Speak to Tortimer there and he will let you know a boat will be available the following day to take you to the island. To discover more about travelling to the island and how to borrow or buy a wetsuit, see the Island Guide. In your own town, you will notice that some trees have fruit on them. You will also notice that these fruit trees all have the same fruit. 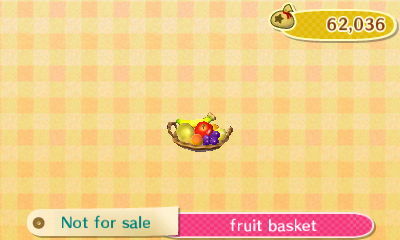 This is known as your town's native fruit and is one of many more fruits available in the game. Any fruit not native to your town is known as foreign fruit, and you can occasionally receive such fruit from your townies, or from your mom when she sends you letters. However, the quickest way to obtain tropical foreign fruit is to visit the island. In particular, you will need to go on island tours, and collect fruit during some some of those tours. Again, more information can be found in the Island Guide. Although some foreign fruit is available quickly from the island, you can still participate in the Harvest Festival without access to the island. 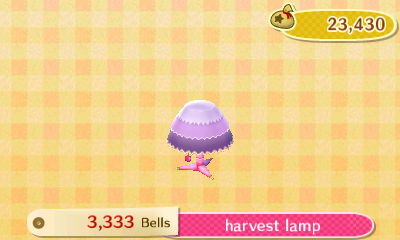 During Harvest Festival, your villagers will provide you with foreign fruit in return for getting them ingredients for their own meals. Equipped with a fishing rod and wetsuit (or access to the island), the first thing to do on the day of the Harvest Festival is to approach Franklin at the town Plaza. Although he will be ready to start at 6am you will only be able to play if you have at least one villager who is awake and in their own home. 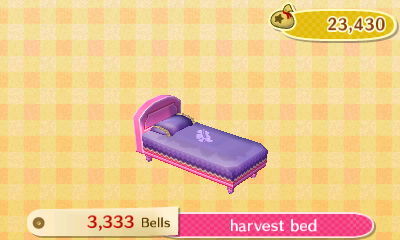 If you have a villager awake but not at home, simply save, quit, and reload your game until your villager is at home. 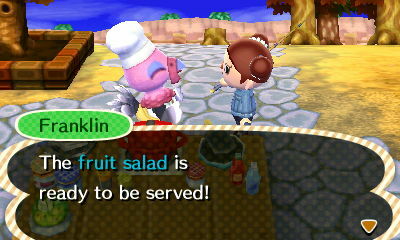 Franklin will tell you he has been invited by Isabelle to cook the Harvest Feast but he is lacking ingredients. He will ask you to help with collecting ingredients for the first course - the starter. When you agree to help, Franklin will give you a list of three ingredients he needs and also informs you that a secret ingredient would also be preferable. It is not essential to provide the secret ingredient, but if you don't provide the secret ingredient it will affect the outcome of the rewards you receive for helping. If you've chosen to prepare in advance by fishing, diving, and gathering, there will still be some ingredients that Franklin will request which you cannot obtain until the day of the Harvest Festival. These ingredients can be acquired only from your villagers who are at home. 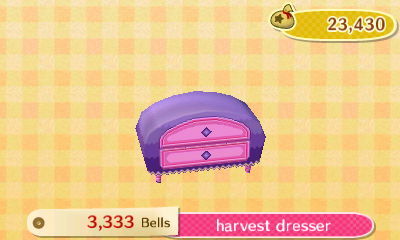 However, nothing is for free and, in order to get the items from your villagers, you will need to do them a favor first. Fish - Sea: Dab, Horse Mackerel, Sea Bass. Miscellaneous: Beehives, Butter, Flour, Milk, Sugar, Vinegar. 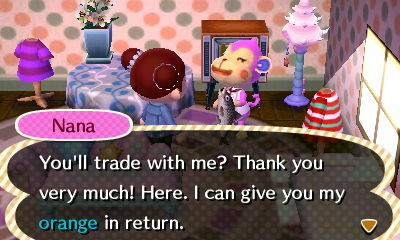 Once you've fulfilled a request for a villager the reward they offer may not necessarily be the item you are seeking. However, do not sell unwanted ingredients at this point. 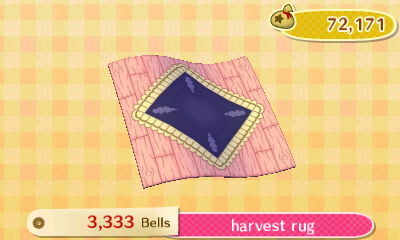 Instead, place them in the Plaza area so that you, or other characters in your town, have access to the ingredients for later. You never know when Franklin may ask for one of those ingredients. 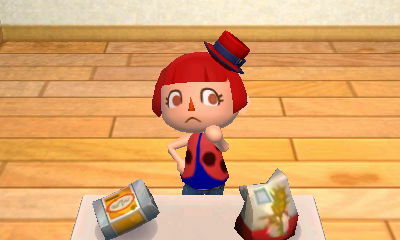 After rewarding you with an ingredient, the villager will also offer you some advice on how to improve a dish with a secret ingredient. You may make a note of this or use the list provided in the next section. Once the advice is given it is worth initiating another conversation to find out what the villager needs for their next recipe. This will save you having to return later to ask them. For each course, Franklin will request three specific ingredients and gives you the option of providing a fourth, and secret, ingredient. Even if you have already acquired the three requested ingredients it is still worth speaking to the villagers inside their houses, and doing them a favour, in order to find out the secret ingredient for the recipe. 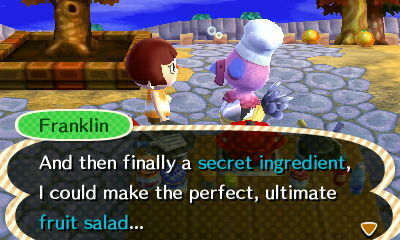 By supplying the correct secret ingredient you will be able to obtain two special items from Franklin. Beware - You must be carrying the secret ingredient in your pocket before you hand over the three requested ingredients to Franklin. If you hand over the three requested ingredients without having the secret one available in your pocket, you will not get another chance to hand over the secret ingredient. Below you will find all the recipes Franklin may be preparing in your town, and the ingredients for each dish. Although more than one recipe is listed for each course, your character will be asked for ingredients for only one dish per course. Each time you successfully provide Franklin with the three requested ingredients and he makes a dish, you will receive an item from the Harvest Series. This will happen even if you don't provide the secret ingredient. However, the first time you provide the correct secret ingredient for a dish, you will receive a Fruit Basket. For the second and third courses, even when providing a secret ingredient, you will only receive items from the Harvest Series. The advantage of providing secret ingredients for all four of the courses is that you will receive a Cornucopia for your endeavors. If you miss a secret ingredient at any stage, or give the wrong secret ingredient, you will not acquire the Cornucopia. Try and do some fishing and diving in preparation for the day, and store sea creatures in your dresser or wardrobe. If you don't yet have a dresser or wardrobe, use the locker at the train station. 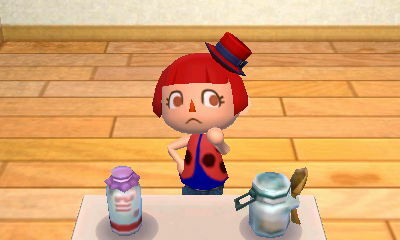 If you aren't preparing in advance, or haven't had time to catch fish in advance, you can save time by going around all houses that are occupied and asking each indoor villager which ingredients they require. It's worth making a note of these requests, and then going fishing to catch all of the ingredients. Except for the dessert, after creating a dish with Franklin he will ask you for ingredients for the next recipe. You won't need to revisit the townies at home if you've already found our what their next request is. Instead, you can go fishing again, or collect the requested fish from your storage. When fishing for ingredients, don't throw away any fish mentioned in this guide. Although it may not be the current ingredient you are looking for, you may get a request for it later. After providing an ingredient for a villager, and receiving an ingredient in return, don't leave immediately. Instead, strike up a conversation again and find out which fish the villager now requires. This saves you having to visit again just to find out which fish they need. 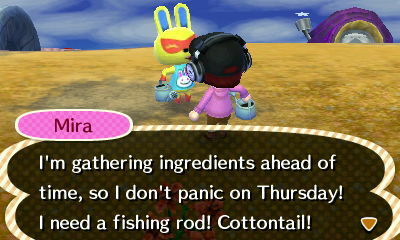 If you already have the newly requested fish in your pockets, hand it over to the villager while you are still there. Sometimes, you will be able to get all the ingredients Franklin requires just by speaking to one villager over and over, and ensuring you have a variety of fish in your pocket before visiting them. 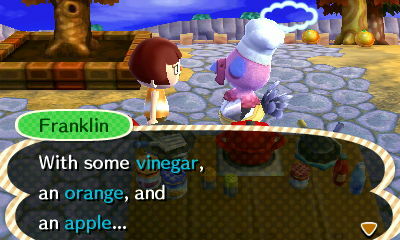 Keep hold of any ingredients you receive from villagers even if Franklin has not requested those particular ingredients. Simply drop the unwanted ingredients at the Plaza. You or another character may need those ingredients later. If your town doesn't already have all the foreign fruit available in the game, try and keep hold of any foreign fruit your villagers give you. If it is a banana or coconut, and you don't yet have any palm trees on your beach, just plant one of each fruit on the sand. If you receive one of the other fruits and you don't already have that fruit tree in your town, chop down an existing tree in your town and plant the new fruit in its place. This will guarantee a foreign fruit tree with that fruit on it. If you find that the villagers who are at home are too spread out, and you are limited for time, just save and reload the game. The villagers who are at home should change. However, if you reload, any requests for ingredients from villages will also change. 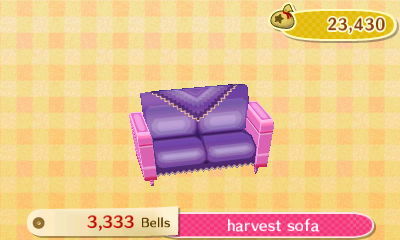 Although Harvest furniture is available from Timmy & Tommy throughout November, you can obtain several pieces of it for free from Franklin if you have four characters in your town and get them all out to play the Harvest Festival. 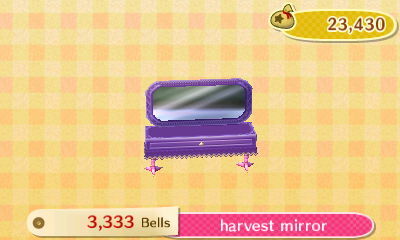 Unwanted Harvest Series items can be sold at Re-Tail for 833 Bells per item. 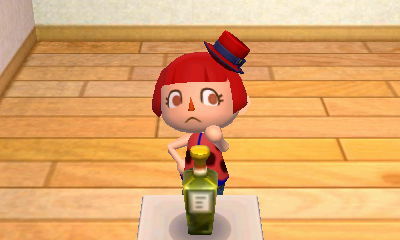 Butter, Flour, Milk, Sugar, and Vinegar sell for 100 Bells each. 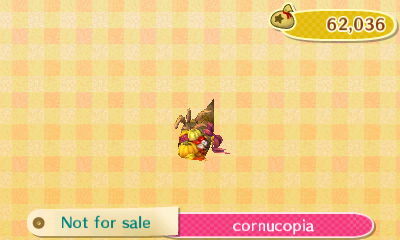 The Cornucopia sells for 875 Bells and the Fruit Basket sells for 200 Bells. If you have a Wealthy Town Ordinance in place you will get more.